Color plays significant roles in many different fields. Among them, food has many colors and it is seriously influenced by color. Color is a critical season in a delicious cuisine. What a food stylist does is to complete a tasty dish laying out foods and its table. Kim Eun-ah, she graduated Chung-Ang University Food&Nutrition. 28-year old Kim is a food stylist. She keeps her blog with more 500 visitants a day. 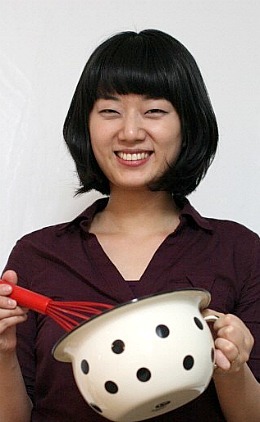 She is one of the promising and competent food stylists in Korea. CAH: How was your trip abroad? Was it for study? Kim: My plan was initially just to travel. But my major interest was ‘food’, so my journey had been naturally though markets, grocery stores and famous restaurants. For example, when staying in France, I had not visited to the Louvre Museum. It was not studying abroad, but through the trip, I met many good people also, learned about food and culture. Back from travel, she became a freelancer. At first, Kim had nothing to do. Thus she faced a financial problem. She fortunately started soon to write a column about foods thanks to a webzine alumnus. Through this, her carrier has gradually developed. CAH: Haven’t you tried to do other jobs? Kim: When I was a child, I wanted to be a teacher. I became food stylist but fortunately I have been also teaching in my inferior and cooking classes. I dreamt of being a flight attendant, once because of its worldwide traveling. My parents didn’t want me to be because of my trouble in health. Some of my stewardess friends said it is not really possible to travel after flight. However if I were them, I would get around here and there. She initially employed only two assistants. However, as the works has expanded, nowadays, she adopted company’s system. Kim has a lot of works to do so she arranged staffs in each team considering the type of work. And she controls the whole work. She plans to register of business under her own name. She will become ‘the head of a department’. CAH: What do you think color represents you? A lot of students these days seem to be only focusing on getting certified and TOEIC score to enter major company. Looking back on it, Kim Eun-ah’s life inspires us to find something makes us happy regardless money or company’s size. It is not too late still. If you find your own way while not the main field, you have to chase your dream.